The soft whirring was barely audible amid the pounding music and the babble of voices at the Paris motor show on Thursday, but we'll be hearing a whole lot more of it in the years to come. The noise was Opel's Ampera-e all-electric compact car, driven on stage by the company's CEO, Karl-Thomas Neumann. The Ampera-e is the European equivalent of the Chevrolet Bolt, and will go on sale some time in the first half of next year. The whir could equally have come from other all-electric vehicles making their debut at the Mondial de l'Automobile, though. Smart and BMW rolled out new production models, while Volkswagen and Mercedes showed striking all-electric concept cars. Renault did both, unveiling an over-the-top concept car, Trezor, and beginning sales of a longer-range version of its established Zoe. Opel's Neumann wouldn't comment on the pricing or launch date of the Ampera-e, although the Bolt is due to enter production in North America this year with a price tag of US$37,500 before government subsidies. Opel CEO Karl-Thomas Neumann arrived on stage in the Ampera-e, the European cousin of the Chevrolet Bolt. One number he was happy to talk about was how far the Ampera-e will go between charges. That's the question everyone has about electric cars, and manufacturers know it. Most of them had their vehicles' range emblazoned on the doors. The Ampera-e's range has just been certified at over 500 kilometers based on the "New" European Driving Cycle, he said. The NEDC testing standard was created in 1992 and last updated in 2000, but most manufacturers still cite it because the numbers are significantly better than the real-world performance most of us will see when driving in urban and suburban areas. Neumann offered another guide to the Ampera-e's range: Last weekend, two Opel engineers drove an Ampera-e from London to Paris, making the 417-kilometer journey without stopping to recharge. According to the on-board computer, the car could have travelled another 80 kilometers before being plugged in, he said. Renault's new Zoe, the ZE40, manages 400 km in the NEDC test, despite weighing only a few kilograms more than the previous model, which could do 240 km on a charge. It's on sale now, and costs €23,600 (US$26,500) for the base model. The battery goes under the floor and contains 192 cells, organized into 12 modules of 16 cells each. The cells are made by LG Chem, and together the companies squeezed 50 percent more energy into the battery by tweaking its chemistry and filling up unused space. Renault began selling a longer-range version of its Zoe ZE40, at the Paris motor show on Sept. 29, 2016. It really wants you to know it has a range of 400 km and is available now. If you were to take Renault's other new ride, the Trezor, around the block, you'd probably hear scraping, not whirring. Renault's over-the-top concept car, the Trezor, is a self-driving monster with a Formula-E electric motor under the hood. Like most concept cars, Trezor's wheels are so big its ultra-low-profile tires leave almost no clearance between the wheel arches. That's fine if you're using the Formula-E motor to race down a smooth straight, but bad news if you need to get around tight corners or bounce over potholes in town. Getting out of the thing is a challenge, too: The whole top lifts up, leaving its occupants to vault over the door sills. Occupants may be optional, though, as Renault said the Trezor will be self-driving, changing color to indicate its status to nearby pedestrians. Volkswagen's concept car, the ID, has a lot in common with the Trezor, including poor wheel clearance, strange doors and weird external lighting. It will also have a self-driving mode: When the steering wheel is not in use, it slowly retracts to form a frame around the instrument panel. Volkswagen thinks it could have something like the ID on the market by 2020, with a range of up to 600 km on a charge. The ID is Volkswagen's concept of what electric cars will look like in 2020. Opposite the Opel stand, Jaguar only paid lip-service to electric propulsion. Where Renault had wrapped its Formula-E motor in a new concept car, Jaguar just put its Formula-E race car, the Jaguar I-type, on the end of its stand -- standing on end. Jaguar had no electric production car at the 2016 Paris motor show, but it brought its Formula-E racing car, the Jaguar I-type. In some ways, Mercedes' presentation echoed Renault's. There was the tiny but practical Smart Fortwo electric drive, counterpart to the Zoe. And then there was the EQ (short for electric intelligence, Mercedes said), a concept car with luminescent blue piping around the body panels and the 24-inch dashboard display. 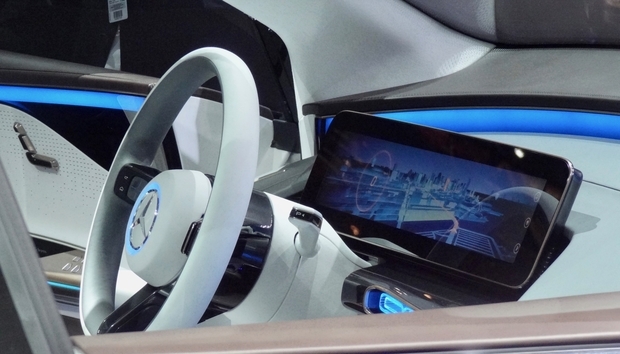 Mercedes showed off a concept car called EQ (for Electric Intelligence). It has a Tron vibe, with luminsecent blue piping around the body panels. If the designers of future electric cars agree on one thing, it's that Disney should never have cancelled Tron 3. Mercedes subsidiary Smart showed off its tiny Fortwo electric drive. The new version of BMW's all-electric i3 has a 50 percent greater range than its predecessor.